An old life, tired and difficult, with a date set to meet its end, is the uncomfortable time-frame that shapes director Pascale Pouzadoux’s deeply beautiful film starring Sandrine Bonnaire and Marthe Villalonga. Madeleine (Villalonga) is celebrating her 92nd birthday with her children and grandchildren in Paris. She smiles, eats cake and is presented with a huge plasma TV that her family think she needs to pass her days. Madeleine receives her felicitations and gifts as her family would want her to, and then releases a bullet: she announces a date and the conditions for her death. Madeleine is discontent living in the shadow of her former self, and in three months she will take her own life. Although this argues the case for assisted dying, La Dernière Leçon (based on Noelle Châtelet’s novel of the same name) is not a political film. On its release in France this November it is destined to spark debate, and by doing so, should register itself as one of the principal Francophone releases this year. However, peeling back the debate, this is as much a film about family relationships and their responses to old age. It is also a film about controlling our own narrative. Madeleine has decided when her life story will end, and so she dictates the direction of the film. After her daughter, Diane (a shining Bonnaire) recovers from the shock, she chooses to spend as much time as possible with her mother. La Dernière Leçon is Bonnaire and Villalonga’s film. They form two bright constellations, claiming the bond between mother and daughter so strongly, it is as powerful as Madeleine’s forthcoming death. Bonnarie’s smile moves between sadness and joy, while Villalonga (a hugely popular comic actress in France) wears Madeleine lightly, lifting the numerous scenes between the two, making them at once hugely watchable and affecting. 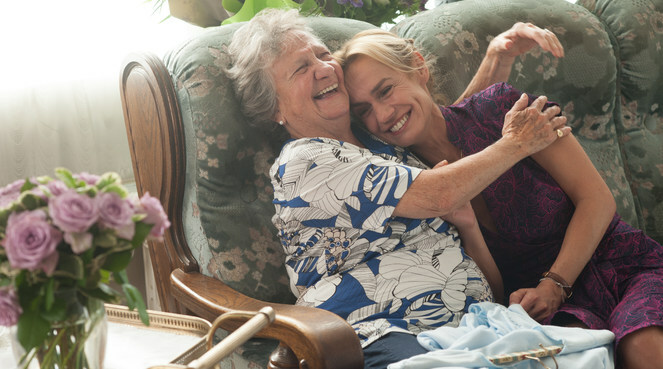 With just three months for mother and daughter to revisit their bond, La Dernière Leçon is a reminder that we often react to our families out of force of habit, following a well-trodden path of behaviour. However, with shocking news and an enforced time frame, the path branches off in a different direction, to a place where it would take the hardest heart to remain unchanged. This entry was posted in French Cinema, French film Review, French Movie, French Movie Review, French Movies and tagged Assisted dying, films set in Paris, La Dernière Leçon, Marthe Villalonga, mother/daughter relationship, Pascale Pouzadoux, Sandrine Bonnaire, The Final Lesson. Bookmark the permalink.